Minimize (Command+M): Use this command to minimize the active Finder window to the Dock and unclutter your Desktop. It’s the same as clicking the yellow gumdrop button. Zoom: This command does the same thing as the green gumdrop button. If you’ve used previous versions of Mac OS X, the behavior of the green button has changed. In Yosemite, when you click a window’s green Zoom button, that window expands to cover the whole screen, including the menu bar. Cycle through Windows (Command+`): Each time you choose this command or use the keyboard shortcut for it, a different window becomes active. So if you have three windows — call ’em Window 1, Window 2, and Window 3 — and you’re using Window 1, this command deactivates Window 1 and activates Window 2. If you choose it again, the command deactivates Window 2 and activates Window 3. Choose it one more time, and it deactivates Window 3 and reactivates Window 1. The next four commands in the Windows menu help you manage Yosemite Finder window tabs (which were introduced in OS X 10.9 Mavericks). 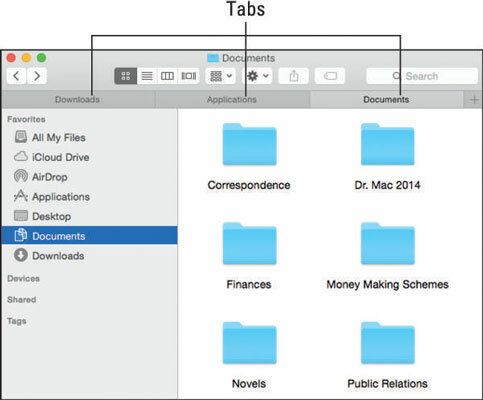 If you’re a fan of tabbed browsing (à la Safari), you’ll love tabs in a Finder window. Tabs let you view multiple folders and/or disks in a single window, with each folder or disk in its own tab. Show Previous Tab (Control+Shift+Tab): Each time you choose this command or use the keyboard shortcut for it, the previous tab — the one to its left, unless it’s the leftmost tab — becomes active. For example, Documents is the active tab in the figure. Use this command, and Applications becomes the active tab. Use it a third time, and Downloads becomes active. Because Downloads is the leftmost tab, if you use this command yet again, it wraps around and Documents becomes the active tab again. Show Next Tab (Control+Tab): Same as Show Previous Tab except in reverse. Instead of showing the previous tab (the one to the left), this command shows the next tab (the one to the right). Use this command three times in a row, and you see the Downloads, then the Applications, and finally the Documents tabs again. Move Tab to New Window: Does just what it says: Moves the active tab into a new window of its own. Merge All Windows: Combines all open windows and tabs in one window. You can click a tab and drag it left or right to change the order. You can also drag and drop a tab from one Finder window to another. The trick is to click right on a tab and drag it onto the tabs in the target window. If you release it anywhere else, the tab will be displayed in a new window. Bring All to Front: Windows from different applications can interleave. For example, you can have (from front to back) a Finder window, a Microsoft Word window, an Adobe Photoshop window, another Microsoft Word window, and another Finder window. In this example, choosing Bring All to Front while the Finder is the active application enables you to have both of the Finder windows move in front of those belonging to Word and Photoshop. If you want to bring all the windows belonging to the Finder (or any other program, for that matter) to the front at the same time, you can also click the appropriate Dock icon (the Finder, in this case). If you hold down the Option key when you click the Window menu, Minimize Window changes to Minimize All, and the Zoom command changes to Zoom All. Other items: The remaining items on the Window menu are the names of all currently open Finder windows. Click a window’s name to bring it to the front.